Income reports are really inspiring to read and motivate me to work harder at my blog because they break down exactly how other bloggers make an income from blogging at home, whether it's a small income or they're making millions from their blog. It's taken me quite a while to build up a sustainable income from my blog and I've learnt a lot of tips and tricks on the way to run a successful blog. I didn't start making money from blogging straight away and it took a lot of hard work and dedication to get it off the ground, but I'm glad it's paid off (excuse the pun) as I now feel comfortable sharing my income report for the past month. I didn't start my blog with the intention of making money, I simply wanted an outlet to write about things that were important to me but when I realised that I could actually make a living doing just that, I was fascinated by the idea that I could turn my passion into my job. I don't think you should ever start a blog just to make money, as you really need to be passionate about what you're doing to stick at it in the long run, however, it's definitely possible to have a profitable blog and be able to quit your 9 to 5 job to become a full time blogger. I've been blogging for less than a year and this past month I as able to make $1257 which I can't actually believe I was able to do. 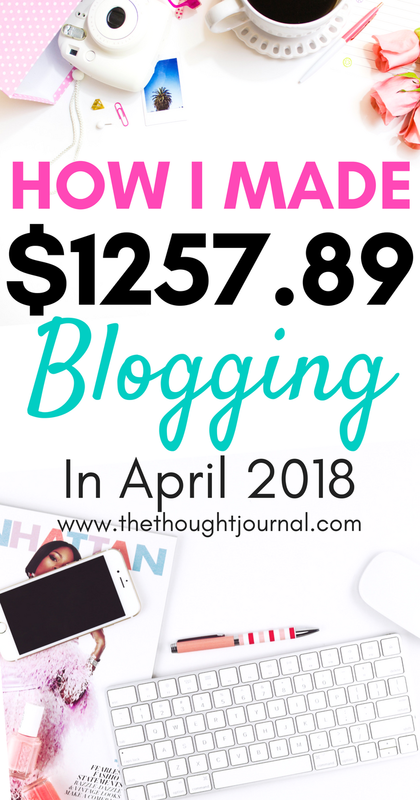 It goes to show that even if you have no blogging knowledge and you're a complete newbie, anyone can make an income from blogging in only a few months. As you can see from my blog statistics, I'm by no means a 'huge' blogger with millions of readers, but that's they beauty of blogging, you don't need to have hundreds of thousands of views or followers to make a decent income from it. As long as you have a popular niche and even a small number of engaged readers and subscribers, you can definitely make money from you blog. The content you create is just as important as the numbers, if not more important than your number of followers. Bluehost is a blog hosting site which is very affordable and a must have if you're thinking of starting a blog or you already have a blog and need to be self hosted. It's only $3.95 per month to have your own blog up and running and self hosted. You can easily monetise your blog when you're with Bluehost and they offer cheap web hosting for all blogging niches. You can also get a free domain with Bluehost. I launched my Pinterest Millionaire Course two months ago and I've had huge success with it so far. A lot of people have signed up and are getting great results from the course. In the Pinterest Millionaire course, I break down my exact strategy on how I get over 2 million Pinterest views each month. Pinterest is my main source of traffic for my blog and I highly recommend this course if you're serious about getting huge traffic from Pinterest. I use Tailwind to schedule all of my pins on Pinterest and my blog traffic hugely increased after I started implementing my Tailwind strategy. I go through my entire Tailwind strategy in Pinterest Millionaire by using the Tailwind Plus Plan and you can get a free month of Tailwind to try for yourself by clicking here. I've recently joined mediavine as my page views have increased a lot and they offer great monetisation options compared to google adsense. However in the past month I made $118.96 from google adsense on my blog and I'm excited to increase those earnings now that I've joined Mediavine. You need to have 25,000 sessions in the past month to apply to be a member. I'm part of a few different affiliate programmes which means that I make a small income from whenever someone purchases something through an affiliate link on my blog. The main companies that I make affiliate income from are Swagbucks, TopCashback, American Consumer Opinion, Survey Junkie and Fiverr. If you want to learn more about affiliate income and how to make money from your blog through affiliate links, I highly recommend Michelle's Making Sense Of Affiliate Marketing Course. Michelle currently makes $50,000 per month from affiliate marketing. I took this course and it completely changed the way I blog and use affiliate links. I learnt so much about making money from blogging through this course and my income increased even a week after I finished the course. You can sign up for the Making Sense Of Affiliate Marketing course here. So that's all for my April blogging income report and those are the main ways I've made money from my blog this month. I hope these income reports can inspire you and motivate you to keep working hard at your blog and realise that blogging can open a whole new world of opportunities for you. Thanks for sharing. Hoping to launch my blog in June and this was very helpful! Thanks for sharing this awesome & inspiring income report.